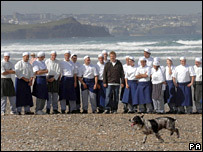 Celebrity chef Jamie Oliver has congratulated young chefs who are graduating from the beachside restaurant he backed in Cornwall. Fifteen opened in May last year to give disadvantaged young people the chance to build a career in the restaurant industry. The first intake of 12 students, who have been training for a year, welcomed the second group of would-be chefs. The restaurant at Watergate Bay near Newquay, opened in May last year. Profits go to Cornwall Foundation of Promise which was established to support, train and guide young people in their bid to become top class chefs. Oliver said: "Very often the home life of students is not what you'd want, so we embrace them as a family. 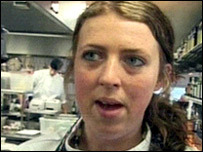 "They can trust us, get a second chance and fall in love with cooking and get a trade. "All that combined is wonderful at building confidence." He added: "These people will be able to bring their skills to this part of the world making tourism a sustainable dream for Cornwall." For young mother Ami Phillips from Penzance, the training was a chance to change her life. She said: "To be here now is absolutely amazing. "I never thought I would get the opportunity to do something like this."